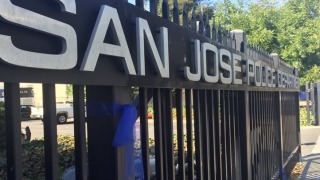 A memorial will be built outside San Jose police headquarters honoring fallen officers under a recommendation unanimously approved by the City Council on Tuesday. An End of Watch memorial outside the police department at West Mission Street north of downtown is an ideal location, where about 80 to 90 percent of the city's officers come and go for their shifts, police Chief Eddie Garcia said. The memorial would remind the officers of the sacrifices made by those before them, Garcia said. The department has seen 13 officers killed on the line of duty, two in just the past 18 months. Michael Johnson, 38, was fatally shot by an armed man during a call for service on March 24, 2015. Michael Katherman, 34, was struck and killed in a collision with a car while driving a police motorcycle on June 14. Many people left flowers, notes and candles outside the police administration building in the days following the deaths of Johnson and Katherman. The fallen officers have been honored throughout the city with plaques at City Hall. Some have had city facilities and freeways named after them, but there's no public place to honor all the officers, city cultural affairs director Kerry Adams Hapner said. An annual ceremony is also held outside the police administration building to honor fallen officers every May in conjunction with National Peace Officers Memorial Day. A committee made up of community members, officers and families of fallen officers recommended the memorial be placed outside police headquarters at 201 Mission St., move forward with developing a design for the site and collecting donations to fund the project, Hapner said. The site would be public and provide an opportunity for personal reflection, according to Hapner. The next steps for the project include selecting an artist who will put together a design that needs to be approved by the Public Art Committee, Hapner said. Hapner reported $138,500 in contributions for the project coming into the meeting and another $41,500 needs to be raised. A total of $20,000 came in between six council members who announced their commitment to the project during today's meeting. Mayor Sam Liccardo said he also donated $10,000 that will add to the $75,000 already dedicated from his office for the project.